As we age, the skin's natural processes of renewal begin to slow and skin loses elasticity. Regenerating Day Cream support the skin's natural processes of renewal to help minimize the appearance of fine lines and wrinkles. balancing moisture content and making skin feel smooth, soft, firm and supple. The appearance of fine lines and wrinkles is minimized, and skin looks and feels vital rejuvenated and radiant. Formulation: Antioxidant-rich red clover, acerola berries, raspberry seed oil and shea butter help firm and refine skin. Jojoba, avocado, sweet almond and olive oils moisturize and smooth skin. Kalanchoe and marsh mallow diminish the appearance of fine lines and wrinkles while balancing moisture content and helping promote skin resilience. I have seen a difference in my skin since using the Regenerating products. I would definitely recommend. I love this product and have been using it on my 63+ years face. I love how young my skin looks and feels. I especially love the compliments about how young I look. I have not received this product I ordered over 3 weeks ago!!!!!! Hi Deborah, Please accept our apologies for the delay in getting your order to you. As relayed to you on 4/2/2019, it looks like USPS has misdirected your order. We are resending the order to you. We appreciate your patience and understanding. Thank you for choosing Dr. Hauschka Skin Care. I always love the smell of all of Dr Hauschka cream! But actually this cream seems still dry for me. I think we need some more creamy base to put on the face before apply this cream on top. What I like best about this day cream is that almost all of the ingredients are natural. I think it works very well, but have not seen any dramatic improvement in my my skin (two weeks in), I am pleased with it as I feel it does provide good moisture. I have noticed other reviewers complaining about the smell, but I don't find it offensive. It is definitely not a sweet smell, it almost reminds me of coffee. The odor does not last long anyway. I would recommend this product, but I do find it expensive. Thank you for your review. We are happy to share that our products are 100% natural. Please call Customer Service if you have any questions. We can be reached Mon-Friday 9:00am-noon and 1:00pm-4:30pm Eastern Time. range are excessively scented. I guess it helps with little, fine wrinkles and it is never too oily: I used it in summer with excellent results. Yes, I am so used to it that I cannot change anymore, therefore I stock up when there are special sales. I would not suggest the cream to ladies under 30, unless they are going through medical treatments. I use many Dr. H products. From toner and serums to makeup. I really like this day cream. Lightly-scented w/vanilla is a nice bonus. In winter, in a cold climate, it helps keep my skin soft and healthy. Use it daily year-round as part of morning routine: milk cleanser (super product, better than soap), toner, rose day cream light, and this day cream. Put sunscreen on last if I’m going outdoors. I have been using this day cream for years and it is fantastic for keeping my skin moisturized. I use it under my foundation in the morning and after I cleanse my face at night. I'm on my second bottle and I hope it never gets discontinued. Skin looks silky with not an ounce of irritation. Great product! The perfect cream for my sensitive and mature skin. I have been faithfully using this product along with Night serum and other Dr. Hauschka such as the masks and Cleansing Milk products for over 1 year. My skin has rejuvenated! It is visibly less aged looking (I am 61 and have spent most of my life outdoors). It feels supple and, well, firmer and younger!! This cream glides on smooth, and isn't sticky or heavy, like so many creams designed for mature skin. It seems to smooth wrinkles, although it's really too early to tell if there's any real improvement, since I just started using it a few days ago. The one thing I don't like is its smell. Wish this one could have a fresh smell, orange, rose, fruity, citrus-y, like the lighter products. Otherwise great. I have been using the clarifying oil and the day lotion on a regular basis for a couple of years, and love them. I am now using this heavier cream at night and enjoying the results. The only drawback for me is the strong smell. But am getting used to that, as I did with the day lotion. It is reminiscent of licorice which I don’t love, but I assume this is one of the herbs that is making the product work so well. Wish there was a Hauschka product with sunscreen to be used as a daily moisturizer. I am almost 69 years old and didn’t take care of my skin for many years (lived in an island, then sunny Florida) but this cream is amazing. I absolutely love it, and I love how it smells. I didn't think anything could pull me away from my beloved rose day creme, but summers in Florida require a lighter creme. This one is perfect. I need to get the one with the tint next! I am a gardener and spend a lot of time in the sun, often without a hat or sunscreen, so I tried the Regenerating Day Cream for the first time this summer hoping that it would give my sun-kissed skin a little extra support. It was great! I love the scent too! I like this cream. It sinks right in. I am not sure if it helps with wrinkles, but the alternatives with harsh chemicals would be worse. I would recommend it. This creme is perfect for sensitive skin. I loved how quickly it became absorbed. I love the texture of this cream, it's thick yet light, and absorbs very well. The smell is fresh and natural. Highly recommend. I have been using the Rose day cream and recently added this as my go to day cream. I think it works better for an every day cream for mature skin. Although it is expensive, it works well for my mature skin without leaving an oily feel. It absorbs beautifully. I love this moisturizer! It has a very pleasant herbal smell, absorbs quickly, and moisturizes very well. It leaves a nice fresh glow, not a greasy residue. It was especially helpful during the winter months. I will definitely buy again. The combination of the day cream and serum are perfect for my dry skin. I love the smell and how it feels on my face. I get compliments all the time on how young and dewy my face looks. Now, if you could just bring the price down a bit! Great stuff, I bought this for my mom and she loved it! This is a good day cream if you add a serum or another moisturizer under it. It can't stand alone for dry skin. I had started to see aging wrinkles on one cheek more than the other and after using this product for 2 months, both cheeks match again! I’m looking forward to seeing what else it will fix in the weeks to come. Smell takes a little getting used to but it’s well worth it. I’ve been using Dr. Hauschka for 40 years & greatly appreciate the products for keeping our skin healthy as we age. 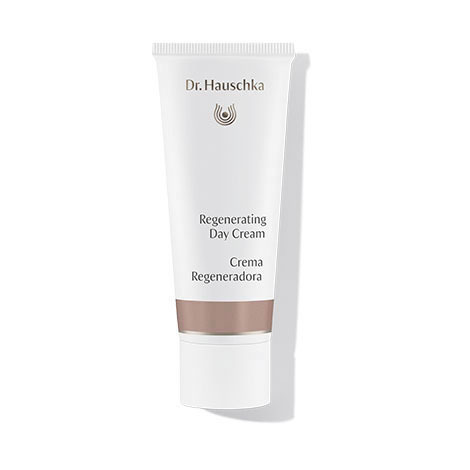 I recommend the regenerating day cream which, like all the Hauschka skin care products are most effective when used exclusively with other Hauschka skin care & makeup products. Unfortunately, Hauschka is phasing out all the makeup products for people with very fair skin, adding shades of beige & brown to concealer, foundation & compact powder while still using some of the numerical codes from the lighter products no longer available. These color changes cover the light that comes through healthy fair skin with a sallow, unhealthily looking tone. Very sad to have to find a complete new skin care / makeup regimen. Another great product from Dr Hauschka! Smells great, minimized those problem pores on the tip of my nose, and softened and minimized those little expression lines above my eyebrows. I Love this product! A little goes a long way. Love the way this cream absorbs into my skin. Feels well hydrated-taut without any heaviness. Only complaint I can think of is that the smell is sort of bland-sterile like. I guess this is a good thing if you are applying makeup after moisturizing. This is just my opinion and does not interfere with my using this cream every day. I found this cream too thick and it feels like it sits on the face. It does not work well with the bronzing tint. I prefer the Clarifying Day Oil. There must be great ingredients in this to have such a horrible smell. I don't doubt that it's effective but I cannot tolerate the order. I appreciate the company using healthy products. Light, unusual but pleasant fragrance. I like this cream. It works. I only just started to use this product but I have to admit it's the first item I have ever used from Dr Hauschka that I was not in love with the scent. As to the effectiveness, the jury's still out. I have been using this for a few months and I just love it. I have been using the Regenerating Serum alone at night, as instructed and then again in the morning, following up with Hydrating Eye Cream and the wonderful Regenerating Day Cream. My face feels plump and soft, my redness and rosacea has calmed way down- a much better skin tone all around. This is an excellent moisturizing cream that replenishes the skin but is not heavy or greasy. It leaves your skin looking fresh and younger. People guess my age at least 10+ years younger than I am! I'm 72 so only so much creams can do. Helps keep skin from forming deep wrinkles between my yearly Fraxel treatment. Can't give it a 5 because wrinkles don't disappear. When rubbing Regenerating Day Cream on my face 15 years ago I felt an immediate response of delight at the quality and smoothness of the cream against my skin. My facial skin is clear and healthy and friends have commented on how smooth it looks and that I don't look my age. This bio-dynamically produced skin cream is the very best and don't think there is anything else out there to match it. Love all products I have. However this one does not re-act well to my skin. I have sesitive skin and this one made my face red and itchy. Can not use. Shoud have stuck with Rose day cream. Can I exchange???? Takes a while but REALLY shows effects! You need to use less than you think, and have the patience to wait about 6 weeks for results, but then you will see REAL results! My pale, Celtic skin is looking better than it has in years. All of your ingredients are natural and my skin feels so much better since I have been using them. Thank you for producing a great product that benefits mature skin! In the morning, after cleansing with Cleansing Cream and toning with Regenerating Serum, apply gently to the face. Daily care with Regenerating Serum, Regenerating Eye Cream, Regenerating Neck and Décolleté Cream and Regenerating Body Cream. Seasonal use of Season use of Renewing Night Conditioner and Regenerating Intensive Treatment or Intensive Treatment for Menopausal Skin.